The hit social party game of 2015 & 2016 is back with more of everything you loved about the first game! 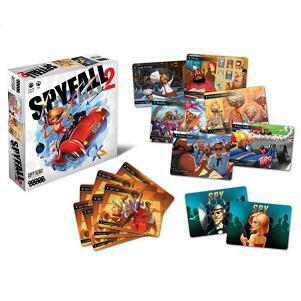 More players, more spies, more locations, and more terribly vague answers to half-baked questions!SPYFALL is an easy-to-learn card game of bluffing, probing questions, clever answers, and suspicion. At the start of each round, players receive a secret card letting them know where they are - a vineyard, jail, coal mine, gas station (20 unique locations!) - Except that one player receives the SPY card instead of the location. The spy doesn`t know where he is, but wins the round if he can figure it out before he blows his cover!New to this expansion:Now games might feature TWO SPIES! When one tries to guess the location, the other one takes a guess as well. Now up to 12 players can play at once! Bigger games means more finger-pointing and shenanigans. 20 new locations adds tons of crazy new fun!